Make a visit to your vet within 72 hours of pick up to go over finishing off puppy shot series. You will be provide with vaccination and worming record at pick up to show your vet. Royal Canin Medium Breed Puppy Food - Food the puppy has been eating. We recommend switching to Royal Canin Labrador Puppy Food for 2nd bag of food until puppy is at least a year old. Royal Canin Labrador Puppy Food - 2nd Bag and continue until at least a year old. NUPRO� Joint & Immunity Support - Great for growing, teething, & health of young and older dogs. 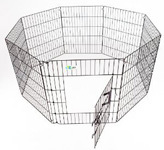 Exercise Pen - Safe Pen for puppy when can't be supervised. Jolly Pet - Jolly Ball - Our dogs & puppies love them! Jolly Pet - Teaser Ball - Our dogs & puppies love them! Kyjen Dog Toys and Products- They have great toys available to order online!! Tire Biter Toys - Great toys!! Nylabone Puppy Teething Keys - They love carrying them!! Kong Binkie - Great for chewing & carrying!! Blue/Purple Ear Cleaner - Click Here For Ingredients use to clean ears and dry after being in water.